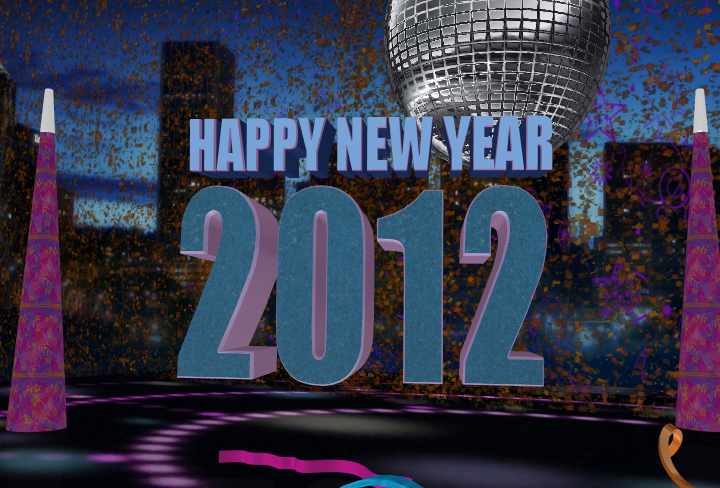 Just 24 hours away from New Year’s Eve now, and the weather will definitely slow down as we head into 2012. Slippery spots on roads tonight, although models show some cloudiness developing late tonight, so that may keep widespread ice to a minimum. That said, it’s mid-winter, we get cold nights, and there is some water here and there…something to be expected this time of the year. Looking ahead, very little weather action the next 7+ days. Just about everything I mentioned 24 hours ago (in the previous post) still applies. 00z GFS continues to show a change to cooler and wetter about 9 days from now, give or take a day or two. The new 00z ECMWF shows ridging or warm wet systems through a week from Monday, that’s 10 days out. We’ll see how things look a few days from now. We’ve got plenty of time, but IF we don’t see a change to colder and wetter in the 2nd half of January, I’ll consider the winter forecasts as real busts. You can’t go through December and most/all of January with ridging and warm systems, and call that a cool and wet winter. Even if February and March and cold and wet. I’m getting a little ahead of things, I know, but that just crossed my mind. Have a safe and happy New Year! I’ll be working again Sunday/Monday. Lots of moisture surging inland again this evening for one last bout of valley rain and heavy mountain rain. The snow level has climbed back up to around 7,000′, forcing Timberline to shutdown night skiing for a 3rd night in a row. Somehow Mt. Hood Meadows and SkiBowl are stubbornly hanging on to a very wet night. The good news is the big dump of snow that will be here in just about 8 hours. Much colder air behind tonight’s cold front moves into the Cascades around daybreak, lowering the sticking snow level down to around 3,000′. Models are showing strong westerly wind at ridgetop elevations all day tomorrow along with plenty of moisture for heavy snowfall. Maybe a foot to 18″. It’ll be a real powdery snow too by tomorrow evening as temps fall. The snow level eventually drops to around 1,500′ or even a bit lower late Friday evening as the coldest air pours inland, but by then the showers will probably be all gone (sounds familiar doesn’t it?). Nevertheless, some of you in the hills above 1,000′ will probably wake up to a dusting Saturday morning. We get some gusty east wind New Year’s Eve and Day. Beyond that, the weather still looks real dead through most or all of the first week of 2012. The reason is the stubborn upper-level ridging re-asserting itself over the west coast of North America once again. This weakens Pacific storms and gives us warmer than average temperatures (at least in higher elevations). 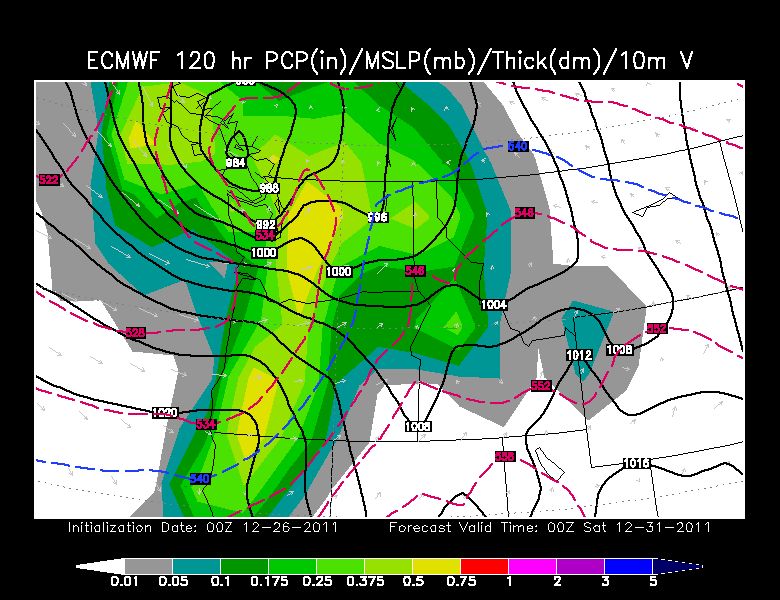 What little precipitation we get next week may fall as rain once again in the Cascade passes. 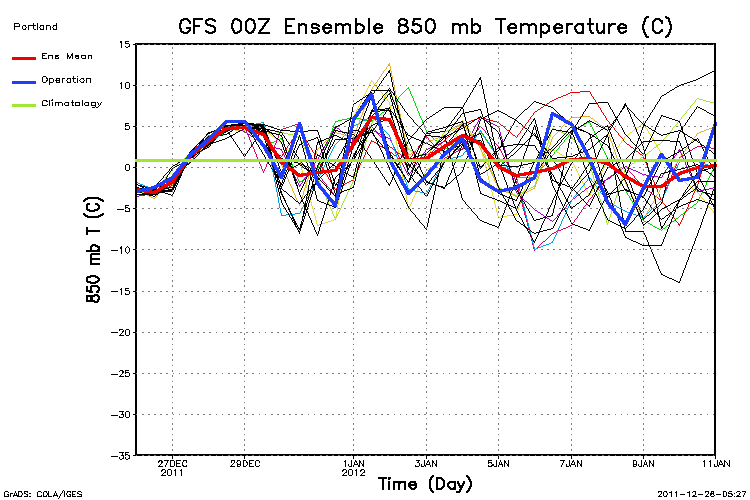 First the 12z GFS 850mb temp ensemble chart. It goes out to around 16 days.. Note they both show a downward trend in the latter half of the period. Today the 4 week ECMWF came out as well. It’s run twice a week out to 4 weeks. 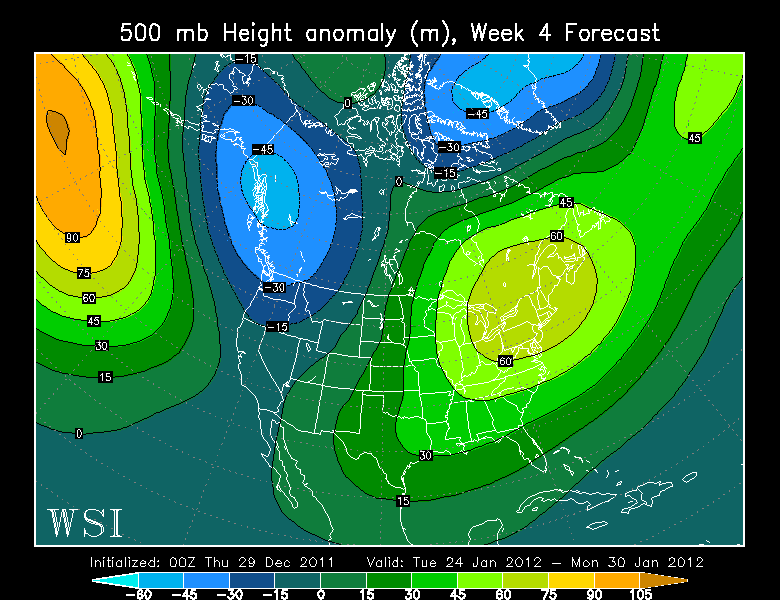 Here are the weekly 500 millibar height anomalies. Orange/red areas are higher than average heights (ridging), blue areas lower than average (troughing). 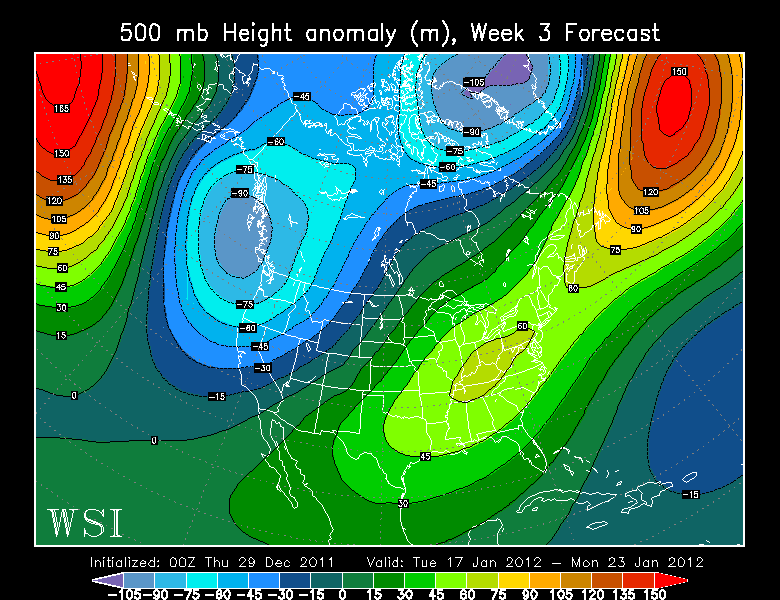 Notice the current ridging over the west coast shifts well to the west from the two week mark onward. This doesn’t give us any detail of course, it’s just the weekly average. But having a trough nearby would spell much cooler weather than we’ve been seeing. This would also be far more typical of a La Nina winter. Here are the numbers…wow. Timberline Lodge has been seeing 1/4 to 1/3″ rainfall per hour for the last 24 hours! 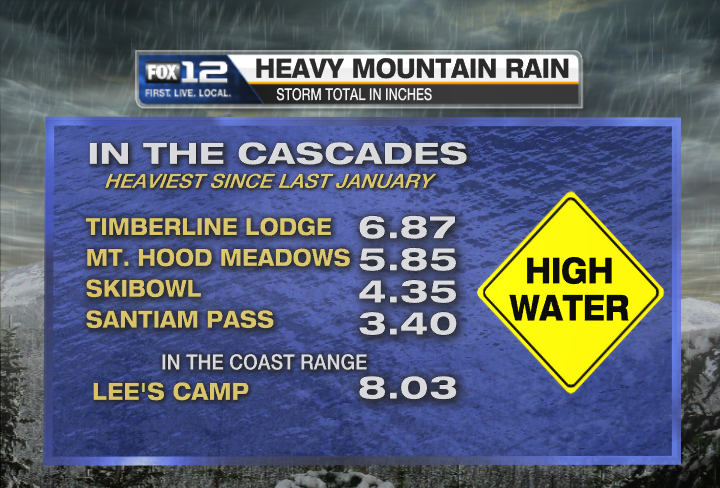 Leading up to the big flood on the Sandy River last January, we saw totals up around 9″ at Timberline Lodge. Please let us know if you start to see flooding in your area. 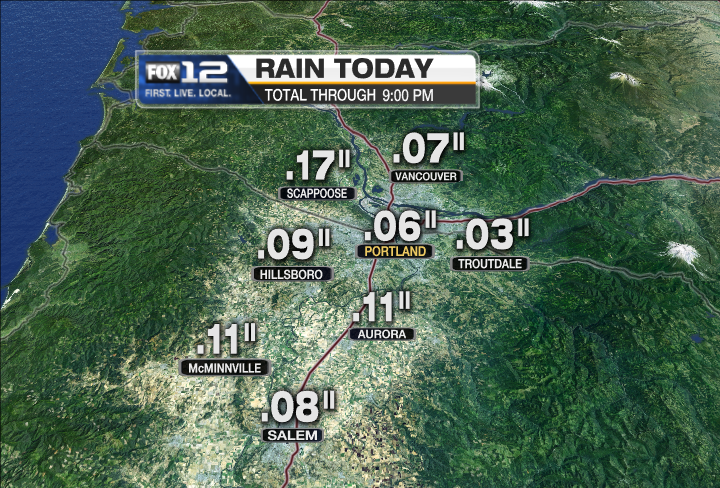 Back here in Portland, only around 1″ so far, so no flooding expected, especially with the rain ending this evening. Can’t believe we haven’t seen flood problems up along the upper Sandy River, but our news people say nothing’s going on up there. Let me know if that’s not the case. The NWS has the Hood and Clackamas Rivers under a Flood Watch due to all the mountain rain. The 12 hour break (the next 12 hours) in rain up there should help quite a bit. Not much to talk about in the longer range maps tonight. 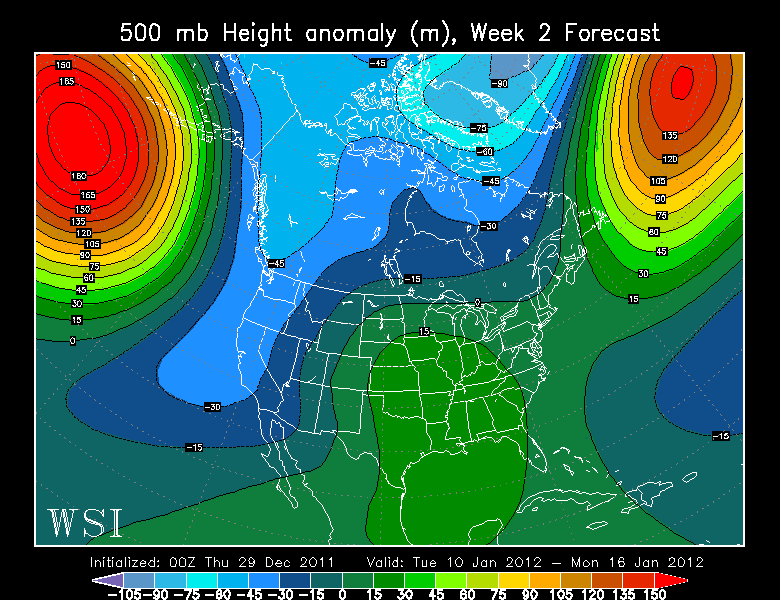 Weak systems attempt to pass through a mild West Coast Ridge the first few days of 2012. So no significant weather through at least the middle of next week. Check out the 24 hour totals up in the mountains: Timberline doesn’t plot on this map, but it’s just under 5″ at 10am. That’s in the past 24 hours! A very wet day in the mountains. Down here in the Valleys the gusty southerly wind is gone until we get to Thursday night. That’s when the final wave and sharp cold front passes through. Until that time, we stay very mild. It’s in the mid 50s here in the western valleys this morning…first time this month. Behind that cold front Friday, snow levels plummet with a much cooler airmass. Models show 850mb temps down to around -7 deg C by Saturday morning. Of course it’s the usual story of the cold air filtering in as showers end Friday evening and overnight. But this IS the sort of pattern where we get random dustings of snow on the hills. Up in the mountains it’s good news as possibly 6-10″ snow falls from Friday morning to Friday night. That’ll make up for today’s washout. The GFS is looking even more like the ECMWF this morning…much drier the early part of next week. 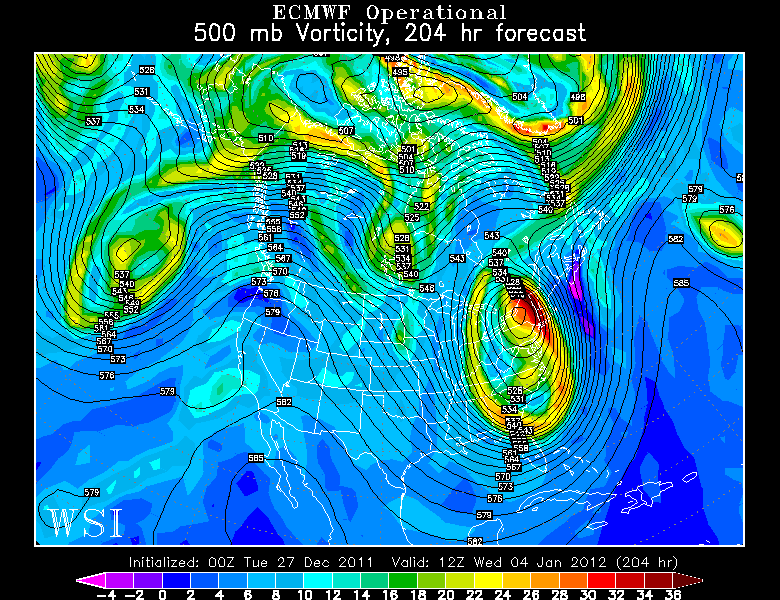 Note the strong easterly wind New Year’s Eve through Monday too. New Year’s Day (Sunday) could be a totally sunny day. The 12z GFS shows a significant change about two weeks from now; I know, I know…it’s only 14 days away and the first model to show it, but a man has to have some sort of hope that our Pacific Northwest Winter can be rescued still… It’s a change to much colder westerly and northwest flow, similar to what we saw during the La Nina winter of 2007-2008. We’ll see how the ECMWF looks this morning. In the mountains, both west and east of the Willamette Valley, the precipitation has been far heavier. 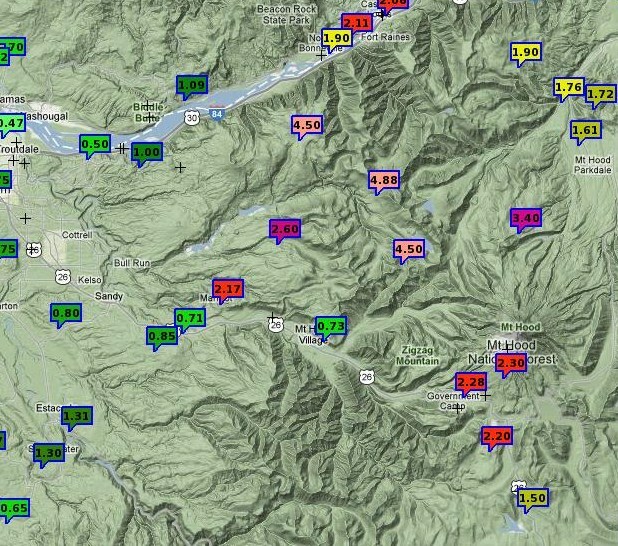 Lee’s Camp, along Highway 6 in the Coast Range, has seen 4.90″ as of 11pm. And the snow earlier today in the Cascades has changed to all rain. Timberline Lodge’s total today (so far) is 2.40″, most of that as rain. In the past 4 hours more than 1″ has fallen…not good for the thin snowpack. Timberline has cancelled their night skiing both tonight and tomorrow night due to the conditions. The heavy rain continues in the mountains tomorrow as a new slug of moisture arrives and sits over us most of the day. Thursday the band moves farther south, then late Thursday night and early Friday we get one last cold front moving through. There is good news for skiers though! The trend the last few model runs today has been for a sharper upper-level trough coming behind that last cold front Friday. 850mb temps drop to -5 to -7 by Friday afternoon and evening. The precipitation will be tapering off, but the transition to colder air plus leftover moisture could leave 6-10″ new snow before we finally dry out. It was a challenging long-range forecast this afternoon due to the GFS and ECMWF differences. The ECMWF was totally dry Saturday through the middle of next week with a strong upper-level ridge developing overhead. The GFS was weaker with ridging and showed a few rainy systems coming through. Luckily we gambled on the ECMWF and now the 00z GFS has turned much drier. Wind this evening turned out even weaker than I expected, no gusts to 40 mph here in the metro area and now the gradient is weakening. A look at the VERY long range (10+ day maps) shows no sign of cooler than average weather. 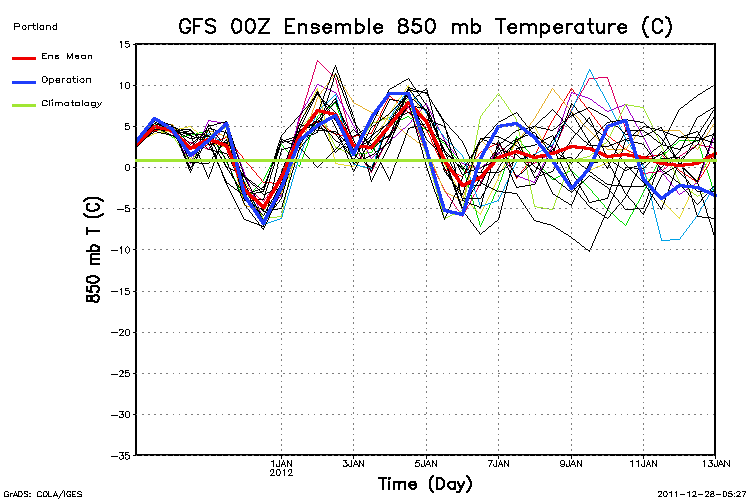 Here’s the new 00z GFS ensemble 850mb chart. Above average for the next 8 days or so, then closer to normal beyond that. 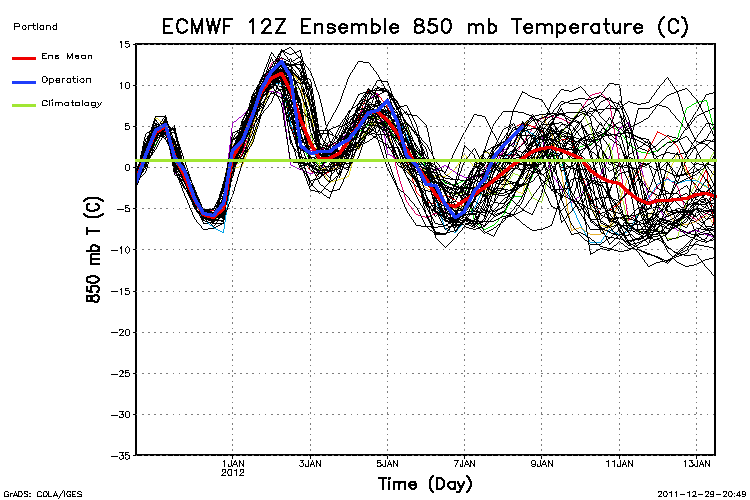 The 00z ECMWF has ridging of some sort over us through the next 10 days. It’ll be brief this evening because I ran out of time, and, I’m cranky that no significant windstorm is in the works now for later in the week. Plus I screwed up the 10pm weathercast (about 30% of it). The most important thing I learned today is this: When your PC pops up a text box that says “AN UPDATE HAS BEEN INSTALLED, DO YOU WANT TO RESTART NOW OR RESTART LATER?”, do it before you go on live television with the computer. Our main weather graphics computer showed me that message a time or two this evening and I thought “nah…I’ll get to it later..”. Well, the box apparently popped up again right during my 10pm weathercast. When that happens, as you know, everything has to stop until you click on the little box! If you are 15 feet away and looking a different direction, you just mumble and complain about none of the buttons working correctly and look like one of those aging tv weathermen that can’t handle the new-fangled technology. Anyway, lots of rain and wind the next 4 days. The big change from last night’s post is slightly different positioning of upper level features (more energy with a wave on Thursday and less on Friday) means no deep low for Friday, but a stronger front with warm rain on Thursday. This is going to be a real pain for the ski resorts…it implies rain at pass elevations from tomorrow midday until sometime Thursday night! That’s not good for skiers…definitely avoid Wednesday and now maybe Thursday too. Great for travellers though. Now can SOMEONE please tell me why we couldn’t get an upper-level ridge with 500mb heights around 579dm. ANYTIME between March and June this year, but now we see it in the deep of winter??? It’s back to work for me this evening. A nice slow time to get all those important Christmas Day items in order; mainly making 2012 vacation requests (a priority! ), clean up emails, and get back into the meteorological groove. There is Good News and Bad News in this week’s forecast: the dry spell is going to come to a quick end this week would be the good news. And for storm lovers it appears we’ll see two very strong systems coming inland. The bad news? The biggest week of the ski season for the ski areas is going to feature heavy rain for about a 24 hour period, even at the higher resorts, from later Tuesday through Wednesday night. IF YOU PLAN ON SKIING THIS WEEK…Choose Monday, Thursday, or Saturday/Sunday. Forget about Wednesday and Friday, and Tuesday will be a wet snow at best, more likely rain below 5,000′. The big picture shows a strong westerly jet stream, the first in a month, punching right into the Pacific Northwest. Several strong waves and their associated deep surface lows move by to the north. The strongest is later Tuesday and Wednesday, but the low is so far north that we end up in the wet and warm sector south of the low. We’ll be in the 50s during this period (regardless of the time of day/night) with gusty southerly wind west of the Cascades. The low pressure center is far enough north that we’ll see gusts stay below 45 mph here in the western valleys of Oregon/Washington. The snow level goes way up during the day Tuesday, at least up to 6,000′ by sunset, then even higher Wednesday. Then we get a break Thursday. The Friday surface low is deeper and tracks closer to us…00z GFS show it hitting the central or southern part of Vancouver Island. It’ll be very interesting to see what the ECMWF does with the system. Any closer to us or deeper and we’d see southerly wind gusts over 50 mph here in the metro area. Once again, as the warmest air mass passes overhead with this storm, snow levels will jump up to at least 5,000′ sometime between late Thursday and late Friday. This is the system I’m watching most closely this week. 10:30pm update: Ohhh…that 00z ECMWF is even deeper, fast moving with big pressure rises behind, and makes landfall just off the NW tip of Washington…the plot thickens a bit. This would be a signficant windstorm north of Portland or possibly here as well. Two items grab my attention here: 6 hours later the pressure has jumped 20 millibars over Portland; a big surge behind the low from the south/southwest. And 16-17 millibars surface pressure gradient from Eugene to Olympia. A common guess for peak south wind gusts in the Portland metro area is 3.15 x EUG-OLM gradient. That’s 50-60 mph here. Looking farther ahead…who would have thought that in a La Nina winter, we’d have a month-long dry spell followed by a week or 10 days of warmer than normal systems moving through. Upper-level heights remain quite high through the first few days of January, so after a break over New Year’s Weekend, more mild storms move inland next week. 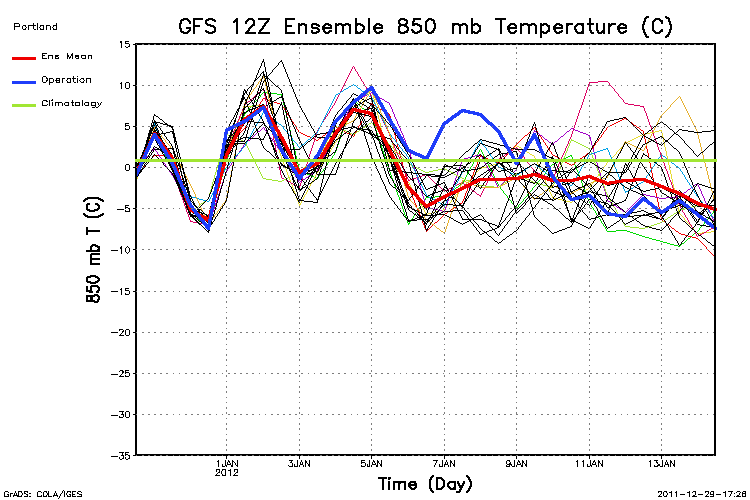 Check out the 00z GFS Ensemble forecast of 850mb temps. Note the ensemble average (red line) is for warmer than normal 850mb temps most of the time through the next 7-10 days, then a bit cooler after that time. What I don’t see is a big blast of cold air or low elevation snow as we head into early January. You are currently browsing the FOX 12 Weather Blog blog archives for December, 2011.